I've been working around the clock these days, quite literally. For nearly 3 years I've not had a chance to go to a dark sky outing, or take any pictures. The gear is getting dusty and my knowledge of how to run it getting rusty. It's a real treat to go out in September. Would be even more of a treat to go out in January! But having the fall objects nice and high and the winter objects rising a bit it real nice. I don't think I'll go back to SkyView Acres in July, August or September as the wasps out there are so bad it really takes the relaxation out of the daytime. I was cooped up in the RV again. Booo! My Ultimate ``Apologies`` to ALL Members of AstroGab."! Five wonderful nights at Indian Trail Spring. Bortle 1 goodness! Under a Bortle 2 sky with friends. 3 nights, but one was a bust with haze or likely smoke from a local fire. I wanted to be at the other location we frequent, but unfortunately it was closed due to large fires in the area. So, the fact that I got 2 decent nights was far better then getting nothing at all. So I've been at this dark sky outing for the last few days. Greg Marshall invited a handful of imagers from the Rose City Astronomers and we have a good turnout here. It's so odd to me being at a star party and everyone is imaging. I have my 16" Dob with me an I've been taking in some wonderful views while the camera is shooting away... one other imager was using his Edge HD 11 for visual as well as imaging, so I wasn't completely alone absorbing photons into my eyeballs! It's been a long time... too long! It's hard to believe it's been 3 years since my last entry. I've been to a few star parties since my last journal entry in June of 2012. OSP 2012, OSP 2013, and a lonely 4 night outing to SkyView Acres on Memorial Day Weekend in 2014. None of those did I take any imaging equipment to. Just the 16" dob to keep it simple and enjoy soaking in the views. The location is my balcony in Bow, Washington, which is 10 miles from the famous bridge collapsed 2 months ago. By the way I had crossed the bridge more than 100 times. I had tried to take series of 8 pictures for stacking. But the cloud moved in and self guider lost the guiding star resulting in elongated images from No 2. On August 1, 2013 at 02:21:55.7 UT, a small meteoroid has impacted the Moons surface. The kinetic energy transformed by the impact into thermal energy also caused a short and intense flash of light that was detected by telescopes of R. Lena, A. Manna and S. Sposetti. I got the go ahead from the boss to purchase a CCD camera. I'm looking at the SBIG ST 402 from OPT for $1695. I like it because it has an internal filter wheel for LRGB work . Anybody hear of any reviews about it? I want to be sure about it before I purchase. 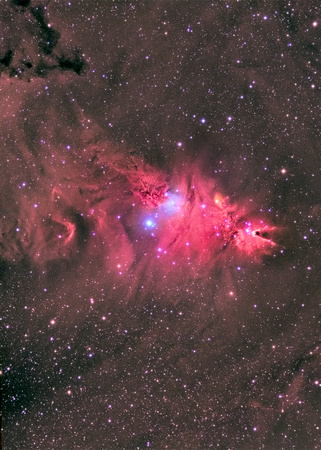 NGC 2264 the Cone and Fox Fur nebula is a diffuse, dark and emission nebula ~2,700 light years from Earth, located in the constellation Monoceros. Imaged January 14 and January 16, 2013 from Ocala, Florida. Ha data: 15minute exposure stacked in DSS for a total of 4 hours. 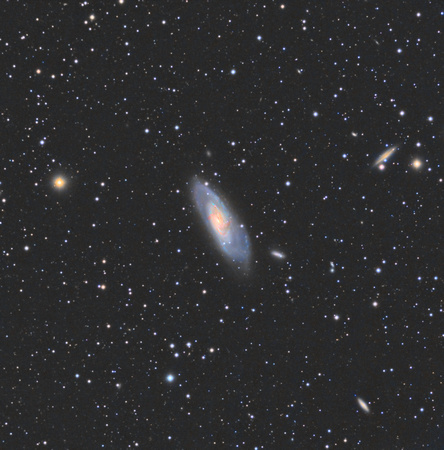 M106 with accompanying galaxies NGC 4217, NGC 4248, NGC 4232, NGC 4231 and NGC 4220. How did you get started in astrophotography?